So our first slice is LIVE versus ON DEMAND. I was going to use the term ‘asynchronous’ for things like forums and ebooks but knew that ‘real people’ wouldn’t know what that means. Luckily I asked on Twitter and people shot back several suggestions, one of which was on-demand. Live: I must be present to participate in the product. It is at a certain time. It is at a certain actual or virtual place. 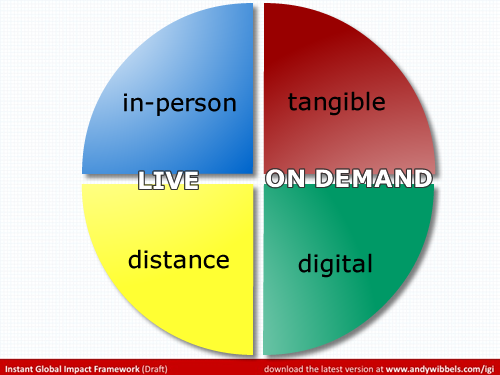 The big point here is presence and a shared live experience. 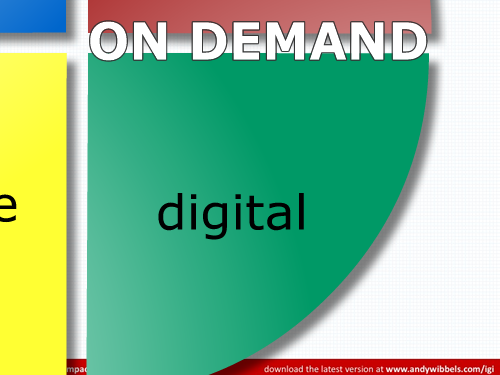 The other format for infoproducts is On-Demand. These are formats that I can enjoy on my own time at my own discretion. These include any recorded or downloaded audio or video, YouTube videos, PDFs and other ebook/document formats – oh and tangible formats like books, CD, etc. The selling point here is convenience. The customer gets to receive the value from the product on their own time. Our second axis is intimacy – this hooks in a bit into our product funnel talk. Can customers actually smell the produt? Or touch it? Can they shake hands with it (or you) or hold it in their hands? 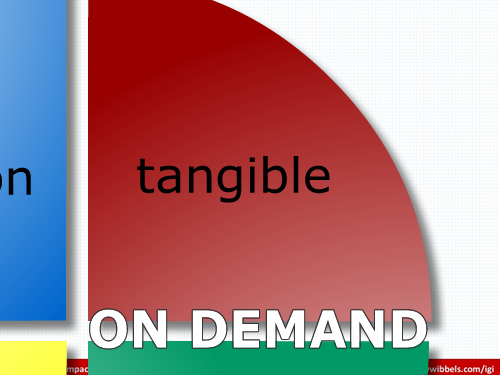 Is your product huggable? You can also think of these two axes as ‘time and place’. These two axes split infoproducts into four groups . In person events are live and intimate. You have to show up at a specific time – and specific place. You actually have to leave your house. The advantage here is the depth of experience possible – and connection to real human beings sharing the same breathing air. You can read Macbeth at home but Lady Macbeth’s hand-washing madness isn’t as thrilling unless you are experiencing it with the actress right in front of you. Here’s a mind-bender: What about movies? Seeing a movie in a theatre is a live event where you have to leave the house and attend at a certain time – but the media format itself is pre-recorded. 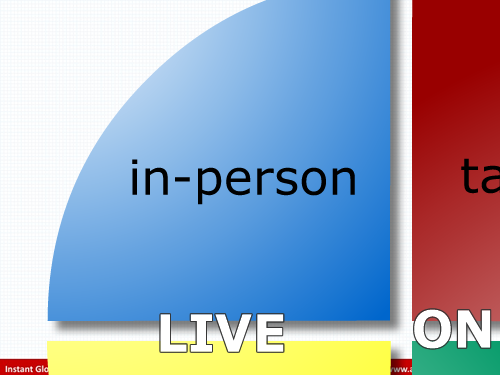 Flipping down to the 6-9 o’clock position we have LIVE events that are not face-to-face. These include teleseminars and webinars. You can stay right where you are and experience the event in real-time but without having to leave your Big-N-Large chair. The advantage here is your customer base can be global and your customers can have a wider breadth of experience and access. I love love love teleseminars and events like these. I always leave a teleseminar call invigorated and ready to take on the world. Swinging to the 3-6 position we have formats that are still ‘not face-to-face’ but are not live either. They are ‘on demand’. You can download the ebook, MP3 or other format at any time. You can stop and start when and where you want, review, jump ahead – you have full latitude in y our consumption of the information. Any finally we have formats that are tangible but not live. I can stop/start/review/skip just like an ebook or video but I can actually hold it in my hands. Best example here, of course, is books. I guess this is less of a post/essay and more just articulating some ideas pinging around my head for a bit. What do you think?